Each item is individual, so the price can not be unified. for your compositions and etc. So the price is determined after ordering and specification all details. You get absolutely realistic stuffed animal (or an ensemble of several animals) made on an individual project for you and consistent with your wishes, the decoration (if any) is also consistent with the interior space cadets will be the preparation and the natural habitat of the animal, except that each product that leaves the studio is marked with a special microchip which further ensures uniqueness of the product. 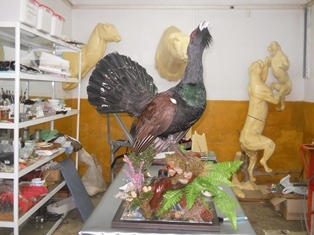 Everything we do with passion and desire that our customers are proud of their trophies made in our studio. The usual practice is payment to be made in two steps, in advance (40%) when supplying order, and the rest upon completion of the product. In the second case, all expenditure are borne by the customer. What is the time to manufacturing? What am I getting against my money? How to obtain the finished (readymade) product? • By mail or courier at the customer's choice. • Upon request by the customer delivery and assembly at the spot specified by the customer. In the second and third case, the costs are borne by the customer. You can give your order, first contact me by phone or email, then specify how to become a trophy of your arrival in the studio. Undertaking (Handover) of an animal in the studio unless it is accompanied by the documents of origin. 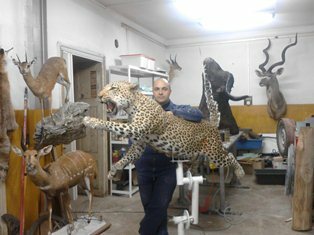 Animals in our studio is prepared on the latest technologies developed by leading taxidermists and businesses in this area. 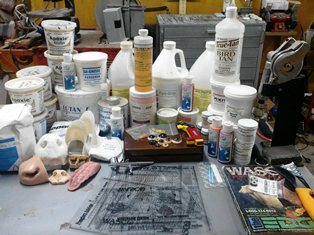 The materials we use are fully imported from U.S. and Europe, in consequence of stuffed animals in our studio are harmless and unpretentious to support. 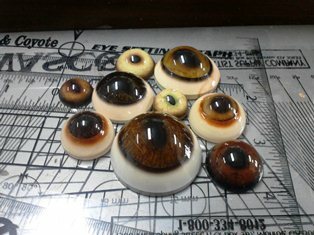 These are the finest bio-optical ocular prostheses in the world. Production time of a preparation is at least 2 months and not more than 6 months. For larger orders or for more complex combinations of animals that period may be greater as it specifies in advance with the client.